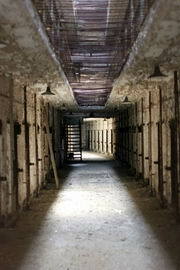 Learn information about Eastern State Prison in USA, Pennsylvania. Read about its location and main attractions. It was opened in October of 1829 as a superior and ambitious "penitentiary," a newly coined termed reflecting the belief that criminal environments caused crime and that hard work and isolation would make criminals regretful or penitent. The prison resembles a medieval castle on the outside and it was constructed in a hub-and-spoke floor plan designed to minimize contact between prisoners who wore masks during their infrequent forays outside their cells. There is a concealed weapons charge, on which he was arrested and convicted within 16 hours, made Al Capone a reluctant, but pampered, guest for eight months. Eastern State Prison was shut down in 1970 (although it later temporarily housed rioters from another prison), and in 1994 it was opened to host historic guided tours of the central rotunda, solitary confinement yards, baseball diamond, chapel, synagogue, death row and temporary exhibits.